More than 50 different kinds of mammals graze, browse, hunt and scavenge in the grasslands and bush country of the Tsavo West. 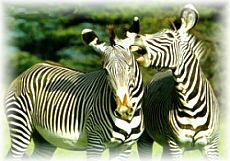 Zebras are always seen slaking their thirst near Tsavo West's luxurious game lodges. Among the more unusual of the animals are the gerenuk, a long necked antelope that browses on the higher, sweeter leaves of the acacia thorns. Carnivores are also abundant in the park. The most famous of Tsavo West's site is Mzima Springs, where rainfall collected in the porous volcanic rocks springs forth at the rate of 225 million liters a day into pools and streams of crocodile and hippo infested waters. Tsavo West offers excellent luxury camp and lodges for your safari in Africa. Severin Camp, Kilanguni Lodge and Finch Hattons Camp are the famous and opted ones.